It’s funny how life treats you sometimes. It was only a couple of weeks ago when I, as a journalist, participated in an interesting event that was organized here in my hometown Rauma, Finland. In this event, the representatives of two Swedish towns, Kiruna and Gällivare, were telling about their enormous project of moving two town centres because of the ore mine that is expanding underground. I don’t know much about the mining industry, but the thought of relocating town centres with hundreds of buildings and thousands of people seems completely irrational to me. And yet so interesting. Perhaps you have read about the situation in North of Sweden in the news, but in case you are unfamiliar with the topic, this is what it’s all about. The mine was founded over a hundred years ago as an open pit mine. Today the ore mine in question is over a thousand meters deep and keeps expanding underground towards the populated areas and town centres. The centre of Kiruna has to be moved three kilometres East and rebuilt by 2020 or the whole centre is in danger to collapse into the mine. In the nearby town, Gällivare, there are two town centres. The second centre, Malmberget a.k.a. ‘The Ore Mountain’, needs to be relocated just like in Kiruna – except that it should be done right now, not by 2020. Hundreds of companies and thousands of people will need a new home in a new area. Some of the buildings will be moved to a new location, some of them will be rebuilt from scratch. What an enormous rigmarole… but how does all this relate to travelling? Funny that you asked; as a result of many random coincidences, last Monday I landed at Kiruna airport and drove past the above-mentioned ore mine and the town centre under relocating. The trip to Sweden came up all of a sudden, through completely different contacts. I only had a chance to see the ore mine through a car window while passing the centre of Kiruna. Therefore the quality of these pictures isn’t the best possible, but I hope they are enough to give you an idea of the size of the mine. I had an unexpected chance to participate in a press trip to Swedish Lapland together with a few other bloggers and journalists. The exact destination of our few days trip was a tiny little mountain village called Björkliden that is located 100 kilometres north of Kiruna. I received the confirmation about this trip only a couple of days prior to taking off, so everything happened in a huge hurry. This was perfect for me; as many of you know, I just love extempore trips more than anything! The sooner the day of departure comes, the better. Our autumn excursion in Swedish Lapland lasted from Monday until Thursday, and even if you might have heard about the ‘love-hate relationship’ between the Finns and Swedes, the trip lived up all my expectations. My memory card is currently being emptied of 723 photos taken during this four-day trip and I can not wait to get to show the best shots to you, my friends. So I wanted to give you a little taste of what I will be posting about over the next few days. Or weeks, let’s see. Even if our local guide in Sweden told us the autumn colours will be at its’ best in two weeks time, I was fascinated by the multicoloured nature already now. You don’t need to be a professional photographer to get a great shot when the setting is this beautiful, or what do you think? The most surprising excursion happened already in the very first afternoon. We had a few-hour-long trip to a local limestone cave system called Kåppasjokk. Unlike we imagined, the cave wasn’t such where you can just stand straight and run around like a kid in a candy shop. Instead, the cave excursion turned out to be quite an extreme adventure. Fine by me! 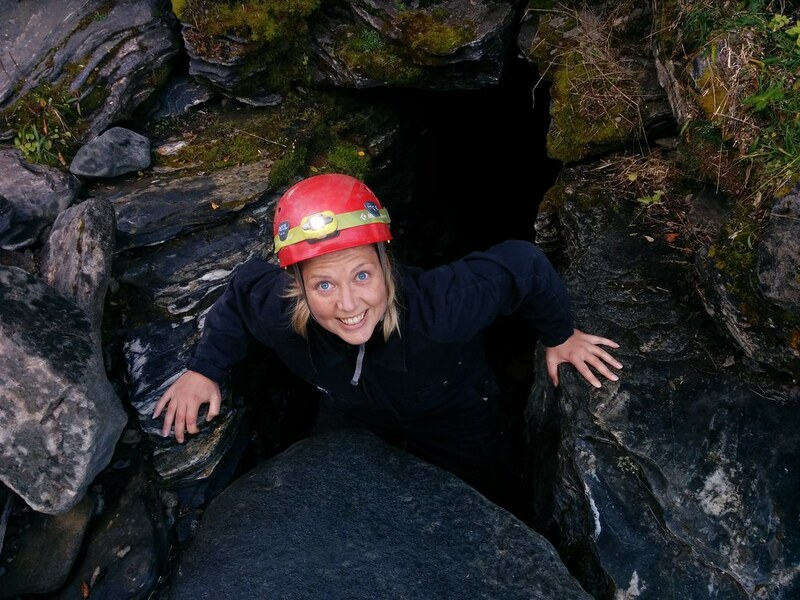 Luckily I was accompanied by another reckless blogger lady, Teea from a Finnish travel blog called Curious Feet, who was willing to dive (or in this case crawl) into the narrow depths of the cave with me. This surprising adventure will be the first one on my list to tell you about in details! When I had the very first glance at the planned program for this trip to Sweden, I was the least excited about a tour of the Björkliden golf course. As a sporty person, I am a bit critical; I have never considered golf as a real sport. For me, a real sport means sweating like a pig and having your heart beat reaching the stars. Golf doesn’t do that. On the other hand, I am always open for new experiences, and even if I have never felt an urge to try golf (excluding minigolf, that’s fun! ), I have always thought I could give it a shot if I ever get a chance. And why not, I might get positively surprised, who knows. As you might guess, dear friends, this is exactly what happened. Although the amazing views decorated by mountain ranges with snowy tops, and extremely challenging and exceptional courses, had a huge impact on the overwhelming feeling that took me over. The picture above is a great example of an exceptional golf course; the green is located approximately 75 meters below the deck, or whatever you call the spot where you hit the ball!? Nevertheless, the real highlight of the trip from the very beginning was a hike on a glacier. I have never ever stepped a foot on a glacier before, nor had a peek under one! It is very likely that I will never have a chance to relive this experience, even if I would never say no for such an opportunity. This is all you will find about our glacier hike for now, as I don’t want to reveal too much of our snowy adventure quite yet. Among other surprises the Swedish Lapland had to offer, I was amazed by the wild waterfalls on the mountains. The one above is called Silverfallet. The beauty of ‘the silver fall’ was coronated with the crystal clear water that was sparkling all the hues of turquoise, and the beach that was covered with round stones sanded by the waves. It looked like a hidden gem in the middle of a rainforest; except there was no rain forest. Instead, the waterfall was surrounded by the bright autumn colours. This was the view from my hotel room window in Björkliden of Swedish Lapland. What comes to the ore mine and the enormous relocation projects in Kiruna and Gällivare, due to the tight schedule I didn’t have a chance to visit the mine or the town centres. It would have been such an awesome way to complete this trip, but I was happy to see the mine even from a car window. Maybe one day I will have a chance for a mine tour, who knows. At least I have now a concrete view of the new things I learned couple weeks back. And yet the whole project remains to be the most absurd and irrational (true) thing I have ever heard of. And yet so interesting. The icing on the cake? Once again the destiny decided to prove it is impossible to foresee when you will find something random you recently heard or learned standing right in front of your eyes. No matter where it is located. What an amazing trip and gorgeous landscapes! I especially like the pic of you in the cave! You are very brave! Sending you all my very best for the almost start of autumn !! Oh cool! Thanks for your quick reply! I’ll check it out!! Saana!!! I have always had deep admiration for you in your travels and courage for adventure but this cave adventures makes me even more impressed by you! I read the post on my couch but I felt as if I were there with you! 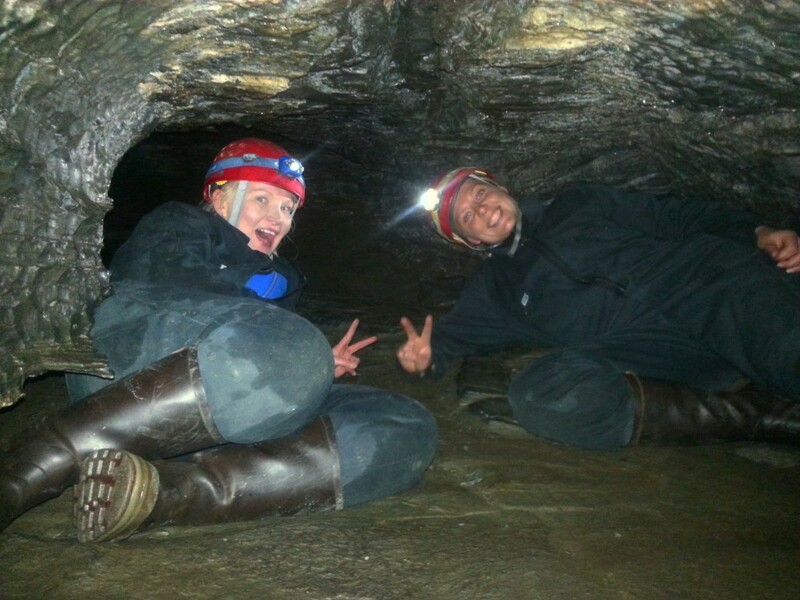 Great photos and description of the cave… And hmm, getting married in there? Perhaps for some! Thanks for sharing your amazing exploration with us and I’m glad everyone got out ok and had fun! Wow , the glacier hike sounds amazing too! Thanks for letting me discover the world through your blog!